Sport Psychology and Coaching: The 30 day challenge - Day 26. So you want to do a triathlon? The 30 day challenge - Day 26. So you want to do a triathlon? Further to my post on Monday, where I advocated trying different kinds of training or exercise in order to keep motivation for your main discipline up, a question I've had asked many times when people find out I run, is "Have you ever done/would you want to do a triathlon?" For years I would say, "I like all 3 disciplines, just not all at once thanks," but now I'm thinking about tipping my toe in the triathlon water - just a sprint one mind - and wanted to know a bit more. Talking with other endurance runners, it turns out quite a few have given triathlons a go having done a marathon or two. One of the biggest advocates I know from the triathlon camp is Nick Holt (@nickersan on Twitter) who I know through my visits to Run Dem Crew. On holiday in France last year, he managed to convince my girlfriend to give tri a go, and in 2013, it looks like I *might* be following in his footsteps. Nick speaks so passionately (perhaps even obsessively sometimes! ), we tapped him up for loads of advice, which he was more than willing to share! So I asked him, for us runners, can you give us some idea of what we may be letting ourselves in for? What is it like? and What do you need to get through a tri, both physically and mentally? Luckily, Nick has been kind enough to pass on a beginners guide, which is what makes up today's post. I hope this helps, and if you have any of your own tips or advice, please leave below in the comments. Over to you Nick! Nick: Thanks Stu. The triathlon is a surprising event - on their own, none of the three disciplines should offer that great a challenge but put them back to back and the triathlon will test even the fittest. In contrast to single discipline events like the marathon, there are some tricks and tips in how each discipline is approached and the transition between them that will ease the journey from start to finish. Before you start you’ll lay out your kit in the transition area. No rocket science here, during the race you want to be in and out in as short a time as possible. Your bike helmet should be unbuckled, shoes ready to slip on and it helps to have a bright towel or similar marker on the floor so you can spot your things amongst everyone else’s. First off is a 1500m swim. Nothing too demanding in the comfort of a heated swimming pool, but in the triathlon the swim is typically in open water. Unlike the pool, there are no ends to rest at as you turn every 25m, you can't see much further than your forearms and if you compete in the UK the water is cold – imagine training for a marathon on a treadmill only to be faced with a typhoon come race day. It's this cold water that's the first thing you notice and something you can't do much about other than letting your body acclimatize. So you need to be thinking as soon as you take the plunge - let the water run into your wetsuit, get head fully submerged and relax your breathing ready for the starter horn. Once underway focus on smooth steady strokes and relaxed breathing while not being too obsessive about the one, two, three breath stroke pattern you’ll have got used in the pool. Also pay careful attention not to drift off course - something easily done without the familiar confines of a pool – by sighting on buoys that mark the course. And in no time the finish will be in sight. With about 100m to go it’s time to start preparing for the first transition. Unlike a single discipline event where you can collapse over the line, you have to focus on what the change will bring. The swim is mostly upper body and so that’s where the blood will be – getting out the water like that and you’ll be dizzy and wobbling about like a drunk on New Year - so start increase the kick in your legs to try to get some blood into them ready to sprint into transition straight from the water. In transition it’s wetsuit off, helmet on (shoes too depending whether you pre-clip them or not) and out the door with your bike. Some baby oil around the ankles and cuffs of the wetsuit when you first put it on will help with the prior and having laid out your kit well the later. The bike stage is 40km, the longest discipline in both distance and time. In comparison to the surprise of the swim, the bike is actually easier than in training – you’ve got the road to yourself, well you and those competing with you, so all you have to do is keep you head down, pump your legs and settle into a rhythm. The comparative tranquillity of the bike make it a good place to take on liquids or gels so that you can hit the next leg, the run, full throttle. But before the run, there’s another transition. Much simpler this time, off with your helmet and bike shoes and on with your trainers. The hard bit is that after an hour or so of cycling your legs will feel like jelly as you switch from using your upper leg muscles to the lower. There’s no getting away from this, which is why it’s so important to have incorporated bike/run brick sessions into your training – they’re just what they say on the tin - you do a bike session and go straight from the bike to a run session, just like you do during the triathlon. Legs aside, it’s just now just a 10km run between you and the finish line. Over the first km your legs get back to feeling how they should and you can relax into the run. In fact the run always feels shorter than a 10km road race to me, probably because I know the end is in sight – no scrambling about in the water trying to swim in a large group or punctures to worry about. In fact the bit that I find the most difficult is counting the laps, something I wish I had a trick for but I don’t. You just have to maintain the concentration, though I always finish the race and spend the time between then and the results being published worrying that I’ve done one lap too few – it hasn’t happened yet. 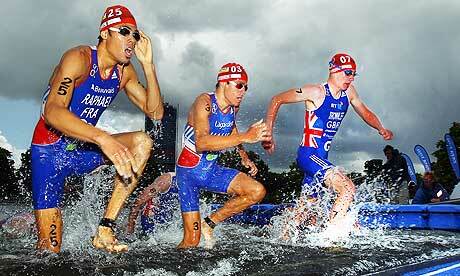 So overall, the triathlon is so much more than the three disciplines. Doing each back-to-back introduces extra physical and mental challenges whether it’s the unfamiliar stresses and surroundings of an open water swim, the slog and time for reflection on the bike or the tired push to the finish for what should be an easy run, but is anything but. However in some ways doing three disciplines also has its benefits. Like any event you need the determination to get to the finish, but unlike a marathon where if you’re not feeling good at half way you have to grit your teeth and deal with it, in the triathlon if you have a bad swim you know you’ve got chances to catch up during the next two disciplines. Likewise on the bike there’s always that little 10km to make up some time and if it all goes to pop during the run, well you know it’ll soon be over and there’s always next season. However a word of warning, triathlons are surprisingly addictive. Training for three disciplines introduces a wonderful variation to your schedule with each discipline feeding positively back into the others – in short I can’t recommend trying (pun intended) one highly enough. Hi Michael, thanks for the reply. I've been just running recently, and only beginning to consider training for Tri, but as you ask, I'll try and get more info posted up here on the discipline. As well, I've not been adding new content lately but I'll finish the challenge by end of this month!